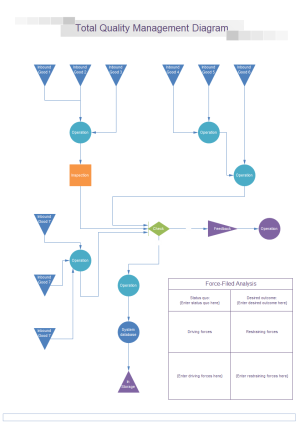 Creating TQM diagram with free templates and examples. TQM diagram has never been easier. 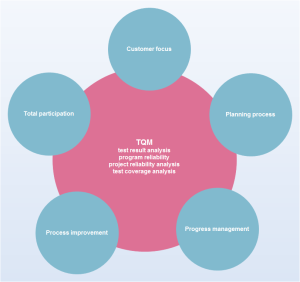 TQM (total quality management) consists of organization-wide efforts to install and make permanent a climate in which an organization continuously improves its ability to deliver high-quality products and services to customers. 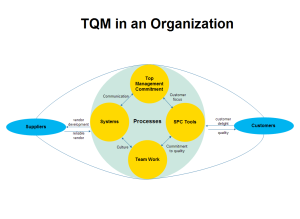 TQM, invented by Walter A. Shewhart, was initially implemented at Western Electric Company, in the form developed by Joseph Juran who had worked there with the method. While emphasizing "quality" in its name, it is really a philosophy of management. Quality and price are central in this philosophy because they are seen as effective methods of gaining the customer's attention and holding consumer loyalty. TQM can be applied to any type of organization imaginable, including schools, highway maintenance, hotel management, and churches. As a current focus of e-business, TQM is based on quality management from the customer's point of view. Total quality management aims to hold all parties involved in the production process as accountable for the overall quality of the final product or service. In the modern context TQM is thought to require participative management; continuous process improvement; and the utilization of teams. 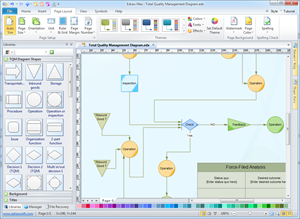 In Edraw, you can find plenty of built-in symbols and shapes to draw a TQM diagram. It provides a full power of modern interfaces, huge, smartly organized library of primitives, along with many examples and tutorials. The drag and drop function allows you to finish a drawing only with a few clicks. You can insert many types of objects: lines, text, pictures, symbols, or connectors. There are some nice looking predefined themes, and you can also define your own drawing style. 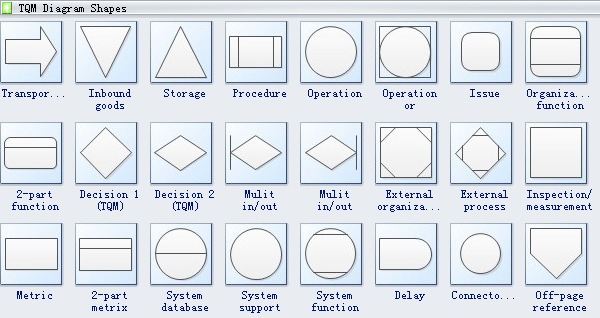 TQM diagram templates contain many special shapes, transportation, inbound goods, storage, procedure, operation, issue, organization function, mulit in/out, external organization, external process, etc. Surely you will find shapes are quite useful when drawing your TQM diagram. Download this tqm diagram template which will bring you convenience and surprises in drawing. A TQM diagram example is provided to help ease your drawing process and stimulate your creativity. 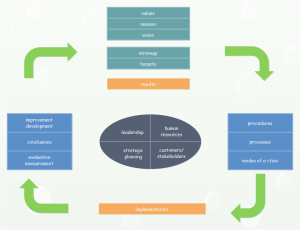 A TQM diagram template is readily available in vector format. Anyone could download and use for your own designs. Another TQM template is provided to benefit our users, with a more creative distribution and more impressive design.